In previous articles, News and Info Cubicle has written about SOPA and PIPA blackout day, this time Cubicle News and Info will write more about SOPA and PIPA - Here are the Reasons SOPA and PIPA blackout movement. Happy Reading..
Blackout movement which carried thousands of Internet sites to oppose the SOPA Bill or Stop Online Piracy Act and PIPA or Protect IP Act, which was carried by the Congress of the United States (U.S.), has attracted the attention of world public. 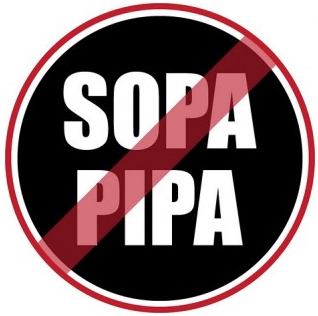 But, what are SOPA and PIPA? SOPA bill or Stop Online Piracy Act was first rolled out on October 26, 2011 by Congress to the United States House of Parliament. SOPA proposed to expand the capabilities of law enforcement in the U.S. and the copyright holders in the fight against trade in copyright and intellectual property through online media. With the SOPA, U.S. Department of Justice and the copyright holder may apply to the court to take action against a site that violates copyright. And based on that application the court may close the ad lines that go to sites that have been deemed violators of copyrights, limiting the search engine associated with the site, up to block it. SOPA also can take action against the spread of content that is not accompanied by permission to the penalty of five years in prison. Even SOPA provides immunity to Internet service, such as online payment and ad networks that voluntarily sever ties with violator’s site. The site can be held accountable for the losses of the copyright holder. PIPA bill was first proposed by Sen. Patrick Leahy (May 12, 2011). PIPA contains about setting offense caused by the distribution of copies of counterfeit or illegal copies and counterfeit goods. PIPA target site was not domiciled in the U.S., but the site is registered and operated from outside the U.S. With authorization from the U.S. Department of Justice, the site of offenders will not be found by your Internet or blocked. Even providers of financial transactions, Internet advertising services, as well as Internet service providers would be prohibited from engaging in financial transactions with the site by removing the link. Also search engines like google.com will be ordered to remove or disable access to that domain. The plan council members will vote on the PIPA bill is related to on January 24, 2012. As for the SOPA bill, Congress still must conduct a hearing with council members.